I never thought I would someday recommend green juice recipes to my readers. For a long while after I started juicing, I never made a green juice. It just never looked appealing to me, the dark green liquids. I knew it wouldn’t, but I had that fear it would turn me pale. Don’t they always say you’re what you eat? After all, drinking too much carrot juice does make your skin orange. Then as I juiced more, I decided to give it a shot and introduce some celery into my apple carrot juice. It actually tasted and smelled much better than I thought! I still can’t drink completely green juices yet, the kind without any sweet fruits. But my juices are much greener now than they used to be, and I find them not any less delicious. The reason I made the conscious choice of adding greens into my juices is because green juices are much healthier. There are loads of sugar in fruit juices, and that’s why we usually find them a lot tastier. Orange, apples, grapes, mango, pineapple, you name it – all the sweet delicious fruits are high in sugar content. While drinking them in moderation should not be harmful to most of us, the sugar in fruit juices can pose as a threat to those who are overweight or are with diabetes. Veggie juices, meanwhile, are much lower in sugar, making them better drinks for everyone. There are only 3.9 gram of sugar in 100 milliliter of carrot juice – one of the sweetest veggie juices. In the same amount of orange juice, the sugar content is 8 g.
Leafy greens are a powerhouse: they’re rich in vitamins A, B, C, E, K, and other antioxidants. They also contain a lot of important minerals such as iron, magnesium, potassium and calcium. According to the USDA, consuming leafy greens have been proved to improve body functions and decrease risks of different cancers. Green juice contains all of the nutrients in the leaves. 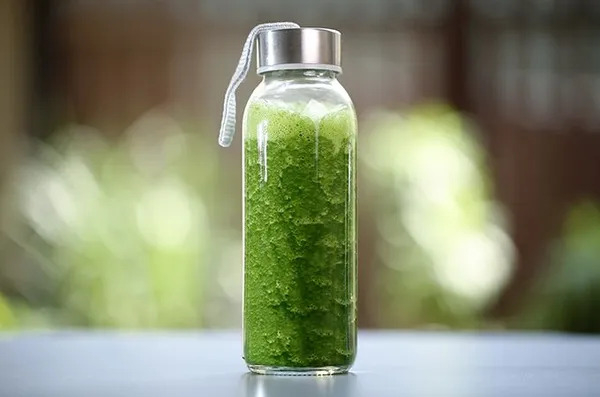 While they can’t completely replace whole foods, as they don’t have the fiber, drinking green juice is highly recommended by health experts, especially if you’re not eating enough veggies. (Which most of us don’t). Note that you will need a masticating juicer to properly juice leafy greens. Except for the Exotic Green Energy Boost, which is made with a blender, all the juices in this list should be made with a slow juicer. If you’re using a centrifugal juicer, try stacking the smaller leaves into packs, and wrap them with a bigger, thicker leaf before feeding them to the juicer. This prevents the smaller leaves from ending up in the pulp collector unshredded. However, I found that the yield is quite low compared to using a slow juicer. Another good way to make green juice is is to pulverize the leaves in a blender. Then, depending on the level of consistency you want for your drink, you may leave the puree as is or run it through a fine mesh/a cheesecloth to extract the juice. With apple, lemon, and orange and only some “softcore” veggies, this is a great starter for those who are still getting familiar with the idea of green juice. Core the apple and chop it into small slices. Peel the lemons and the oranges. Cut into halves horizontally, then into smaller portions. Cut the celery into short sticks to prevent the fiber from clogging the juicing machine. Feed the ingredients into a juicer. Collect the juice, mix well, and enjoy. Add a teaspoon of honey if you want it sweeter. This juice is loaded with vitamins and nutrients. But it’s also very delicious, thanks to the natural fragrance and awesome sweet and sour taste from the apples, celery, and lemon. Core the apples. Chop the fruits and veggies to fit in the juicer. Peel the lemon and cut in horizontally halves. Run everything through a juicer. Alternate between the harder ingredients and softer ones, and end with some apple. High in vitamin A, C, and K, and low in calories, this juice offers a light detox in your system, leaving you with a young, fresh appearance. Thoroughly wash all the fruits and veggies. Core the apples. Peel the lime. Chop all ingredients to fit in the juicer. Feed the ingredients through a juicer. All the ingredients being packed with antioxidants and minerals, this juice promotes cell repair, boost your collagen production, and gives your skin a thorough healthy detox. Do a thorough wash for all ingredients. Core the apples. Chop them to fit the juicer. Cut the parsley and the celery into short portions to prevent machine clogging. Run the fruits and veggies through the slow juicer. *This drink is to be made with a blender instead of a juicer. With high content of vitamins, protein, healthy fat, calcium, and all the fiber retained, this drink gives you a healthy, sustainable boost of energy. Wash and prepare the ingredients. Chop the kale and the pineapple into small portions. Put everything into a blender. Run the machine until the mixture is smooth. I have drunk many fruit and veggie juices but never with leafy vegetables. I have to try some of these recipes. Thanks for listing the benefits! So now it’s time for you to try it! I think the celery lemon one would be my preferred choice. It’s one of my favourite too! !